Softaculous has been developed in a way which allows you to actually test and rate an application before installing it on your account. The auto installer has different features that you can use to easily decide if you want to use a certain application or not. In addition, Softaculous can be used to create and restore backups of your websites directly through your browser. Below we have described how to use the advanced features that our Softaculous hosting provides. Once logged into Softaculous, you need to select the Script Demos blue play button from the top right menu. You will see the following page. You can select any of the applications by clicking on the corresponding icons. You will be taken to a new page on which you can test the application. 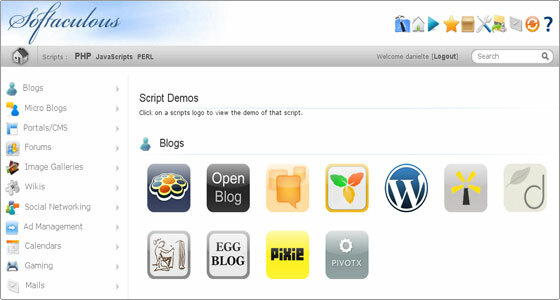 The demo for an application may either be available at the respective application site or at the Softaculous Demo Site. Once logged into Softaculous, you need to click the Script Ratings star button from the top right menu. You will see the following page. Again, to check the existing ratings for an app or submit a rating you need to click on the corresponding icon from the list. 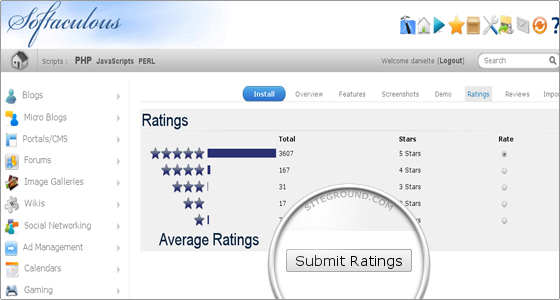 You will see the following ratings tab which also allows you to rate the software. To submit your rating you need to click "Submit Ratings". Next to the Ratings tab there is another tab which you can use to find out other people's opinion about a certain application. The name of the tab is Reviews and when you select it you will see a list of different reviews. If you scroll down to the end of the page you will see the Review submission form. 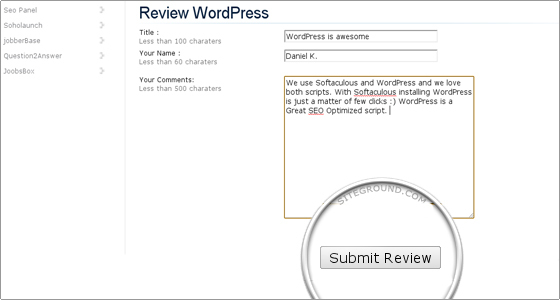 Simply fill in the blank fields and submit the review by clicking the "Submit Review" button.